The ranch country of southwestern Colorado in late autumn. This is a more subtle and difficult aspect of photography, a topic I’ve thought about off and on ever since I picked up a camera. Until now I’ve avoided writing about it. It’s one of those things you sort of feel when you see a picture. It can be subtle, and perhaps you don’t notice when it’s missing. But every image that has a sense of place is better for it, often much better. I’m very subject-centered when it comes to photography. I really only care about the subject. It sometimes seems I only care about light, but that’s because any subject looks better in beautiful light. While a lot of photographers look for a subject (like a person or interesting tree) to put into a scene, for me it’s mostly about the scene itself. That’s because every scene is a place, and I think of places as subjects. Any interesting things – people, animals, rocks or trees – that I can include in the scene are there because they make the place more interesting to look at. For me, they’re smaller elements of the larger subject, the place. But if they don’t really belong there, I don’t really like the picture. Courthouse Towers in Arches National Park, Utah speaks strongly of the American Southwest. Okay, so now that you know my biases on the topic, let’s see what we can do about laying out ways to insert a sense of place into your images. By the way, even if you’re mostly a people photographer, or you do wildlife, these tips apply to you, maybe even more so than to landscape photographers. And if you do travel photography, this is important stuff! Learn as much as you can about the place: the plants, animals, human and prehistory. Of course you’re going to know more about areas close to home, but don’t get complacent. We’ve all been surprised to learn something we didn’t know about our home-towns or states. Use that knowledge in your photography. The more you know, the better your pictures will be, so when traveling don’t just research places to photograph. Start with the background information and let photo spots fall out from that. Study the pictures in magazines like National Geographic. The editors at Nat. Geo. nearly always choose images with a strong sense of place. This shot of a farmstead in Nepal has a stronger sense of place by virtue of the high Himalayan mountain in the background. Photograph during “typical” weather conditions. For example, I live in the Pacific Northwest. This area is most famous for its rain and tall trees. I know (more than many residents) how diverse it is here, with glaciers, deserts and canyons, sunny grasslands. But when I can, and at least in western Oregon and Washington, I do landscape photography during rainy spells. If you avoid the stormy weather here, you are not going to capture images with the strongest sense of place. The rugged coast along the northern Olympic Peninsula in Washington is often wrapped in fog. When you have a strong subject, by all means zoom in. But also make images with a hint of background, perhaps out of focus. Include shots that are dominated by landscape, with the subject much smaller. Try putting the subject in the background with a ‘typical’ foreground. In other words, mix it up and shoot at a variety of focal lengths and apertures. When you view the pictures later, ask yourself which one has the best balance between impact/interest and a sense of place. This house in Leadville, Colorado, registered as a historic landmark, is better placed with the foreground picket fence. Speaking of strong subjects, when you’re looking for subjects to target, think about how strongly they will place themselves. In other words, photographing waterfalls here in the Pacific Northwest is a no-brainer in terms of sense of place, even if a bit obvious. Some things like lighthouses could be on any coastline. So be on the lookout for elements that will zero in on the specific area. A very recent image of Latourell Falls in the Columbia River Gorge was captured during typical Oregon weather. Several subtle elements come together here to place this shot. Look at the plant growth, the unique house, and take a guess where it is in a comment below. Move around. This is good general practice, but when combined with an open-minded focus, this can really open up compositions that add a sense of place. Sometimes I’m not even aware of it, but the desire to shoot a composition that is unusual or different will often yield a picture with a strong sense of place. While you’re moving around, try shots with very wide angles, focal lengths shorter than 17 mm. Even consider getting a fisheye lens. When combined with getting very close to things, this will help to put viewers into the image, which is part of giving them a sense of place. Look for compositions that include the little things that will tell viewers where the place is. This shouldn’t be subtle. People might not know as much about the place as you do, and so need fairly obvious elements to place it. For example, Spanish moss in the deep south, ferns here in the Pacific Northwest, red rocks in the Southwest, eucalyptus trees in Australia and baobabs or mopane trees in Africa. The ferns and big trees give this image a strong sense of place, and many viewers would recognize the trees as redwoods, greatly narrowing things down. Include shots with plenty of depth. I wrote a blog post with tips on adding a sense of depth to your images, so check that out. Anytime your images have the illusion of depth, the viewer is drawn into the image as if they were there. By itself this doesn’t do much for your goal of including a sense of place, but in combination with the other things, it can be powerful. Shoot details and small scenes. This allows you to focus on one aspect of a place. It’s a great way to zero in on small elements that help to place the image, things that might get lost if they were part of a larger composition. The adobe construction is apparent in this image of a historic home in Taos, New Mexico. Also do the opposite of the above. Step back and show the surroundings. Sometimes you can be too close, or inside of a place, which robs the viewer of the ability to see its overall setting. Sometimes this is called the “establishment shot”. It establishes the setting. The mountain town of Ouray, Colorado is closely surrounded by the spectacular San Juan Mountains. Don’t forget a good caption. I did a recent post on captions. Although your photo should do most of the work of giving the viewer a sense of place, why not include a good subject-centered, educational caption to fill things out? Don’t turn up your nose at shooting the occasional sign, if they’re interesting and can be used to place photos in a slide show. Crossing into a remote part of Colorado on a lonely road. Including some human elements in landscape photographs can help to give them a sense of place. For example, a rail fence says ranch country; when combined with quaking aspens, the impression of a rural Rocky Mountain setting is strong. Sometimes the residents of an area have done the work for you. Shooting public art like this mural in Taos, New Mexico can add to your image the sense of place felt by the artist. The adobe construction also helps place it. Colorado in fall means the quaking aspen are in golden leaf. One caveat: Beware the cliche! There is a balance between not being too subtle and overdoing things. This is most common with travel photography. If you’re including something like the Eiffel Tower, make it a small part of the scene, or somehow get a fresh take on it. Don’t avoid shooting something like the Taj Mahal straight on, especially in beautiful light. Just move around and try different compositions and perspectives. 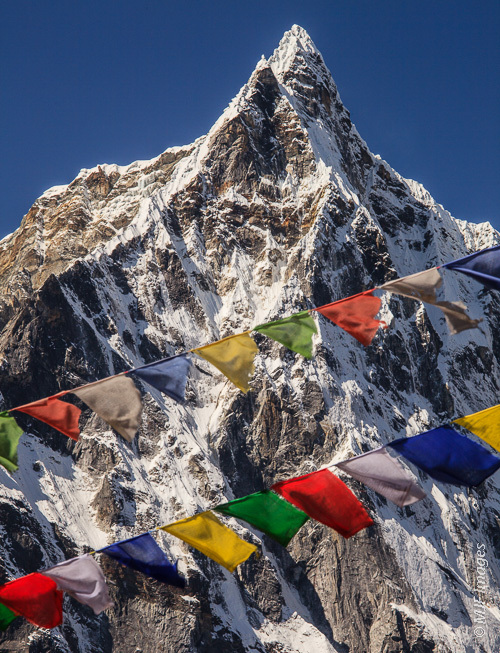 Prayer flags in the Himalaya are not hard to find, so they have become super-abundant in pictures. But they still insert a strong sense of place into an image. Just don’t overuse them! When it comes time to process your images on the computer, pay close attention to the mood you create. Often it’s useful to try the image in black and white to see if it strengthens its sense of place. The idea of place is tied to that of time, so if you think having an ‘old-timey’ look will help, then go for it! Whatever you do, don’t treat all images in a similar way (such as high contrast and saturated colors). This is from someone who was guilty of that for a time. Lake Crescent on Washington’s Olympic Peninsula has the kind of low-key atmosphere that harkens back to the old days of summer vacation, a mood enhanced by sepia and film grain. An image with a strong sense of place can make the viewer a part of the scene, which of course strengthens your images and makes people want to look at them. And it’s not just travel photography that benefits; all sorts of pictures are made better with a sense of place. Have a great weekend and happy shooting! Road to Nowhere: This image is actually one of my favorite images from the desert southwest. I know many wouldn’t agree, but you tell me. Despite the lack of any obvious identifying features, does it have a strong sense of place? An image from Arches National Park in Utah profiles the park’s typical ‘fins’ of orange sandstone. Autumn in Utah’s Wasatch Mountains means quaking aspen in their golden glory. Photo captioning is a subject that never really occurred to me before last week. And I don’t really known why. It just seemed to fly under the radar, something not really relevant to photography. How wrong that is! Writing good captions is a part of presenting your images well, and is just as important as good editing on the computer. As images have proliferated on the web, so have bad captions. Let me back up. When talking about photography, I try to be as non-judgmental as possible. I have my own ideas of what a good image is, but I don’t presume others will always agree. Photography is an art, thus completely subjective. So let’s just say the following is my opinion and leave it at that. The images here are a sampling from my recent trip through the American West. I’m picking the keepers now, and succeeding posts will feature more. They are all copyrighted, thus not available for free download without my permission. Please click on the image or contact me directly if you’re interested in purchase of prints, downloads, etc. Thanks for your interest. The Alvord Desert in southeastern Oregon attracts an enthusiastic group of “wind-riders”. The Superhero Story: I put this first because it annoys me the most. And it’s getting more and more prevalent. Even pro photographers succumb to the temptation. Of course Facebook is prime hunting ground for these captions. But even sites like Earthshots.org (which features excellent nature photographs) seem to love these silly captions. The superhero story is a long, involved account of how the photographer got the shot. Nothing about the subject unless it is some hazard that he had to face down. You find out that in order to bring you this amazing shot, he had to brave dangers that would make mere mortals like us turn and run. Reading these captions, you find out that the photographer entered dangerous waters, faced vicious predators, danced at the edge of tall cliffs, endured extreme weather and discomfort. In short, he performed feats that Homer would have been proud to include in The Odyssey. Notice I use ‘he’. That’s on purpose, because this is primarily a male ego thing. It is also pure B.S. These captions are about the photographer not the subject. Will the viewer think the image looks better after finding out the photographer went to some trouble getting it? It’s more likely the reader will discover the photographer has an inflated opinion of himself? Early morning light floods into the historic Peter French Round Barn in the “outback” of southeastern Oregon. Camera Info. Only: Pros do this all the time, I think because they are sponsored by the camera/lens manufacturers. I certainly don’t mind knowing the camera and lens used, but don’t tell me that and leave out the camera settings. I don’t really care if someone uses a $6000 camera and $12,000 lens. After all, a person shooting with much cheaper gear could easily have much better images. And would it kill these guys to write an actual caption for the photo? Where is it, what is it? You know, a caption! Inaccurate: I’m running across this more and more. These days, people want to be seen to know about all sorts of things. I want to say to them, “hey, I’m slightly impressed you know this, but I’ll never mistake you for a Renaissance man.” It’s certainly okay to give detailed info. in your captions. But if you don’t know a lot, don’t get too specific. Nothing wrong with going into detail, but do your research. Get it right. Deliberately Misleading: I understand why a photographer might not want to reveal exact locations. I have my favorite (secret) spots too. But for the most part, you can easily give location information without giving away your exact shooting position. I think it betrays insecurity when a photographer is afraid that others will replicate the shot. Who cares about imitators? If you are secure in your ability, you’re not worried about such things. A frosty morning walk along the Rio Grande River is rewarded by cottonwoods in autumn leaf. The end of fall comes to the high desert of southeastern Oregon. “Termination dust”, the winter’s first snow, mantles the peaks in ghostly white. Keep it Short: Say enough but not too much. Captions should be short paragraphs, one line if you can swing it. Don’t worry about writing sentence fragments, but make it readable. Just the facts. Be Accurate: Do your research. Find out the animal’s correct name, get the place-names right (including spelling), was it sunrise or sunset, and so on. Most important, don’t go beyond your knowledge. If you don’t know for sure, don’t include it. Make it Subject-centered: Give the viewer some idea of the What/Where/When of the image. If you want to add camera & lens info. make sure to include the settings too. It is even more important to give information on the subject when the title lacks it. Titles; don’t get me started on those! Avoid “Making-of” Stories: Following the above point, make it about the subject and consider a blog if you want to talk about how you got the shot. There simply isn’t room in a caption to give a lot of back-story. Spelling & Grammar Count: Run spell-check. While I think phrases and sentence fragments are fine in the interest of brevity, that doesn’t mean bad grammar is okay too. Captions are writing, and bad writing looks sloppy. It can reflect poorly on you and your images. Add Interesting Stuff: If you know something interesting about the subject, include it. You don’t have to be long-winded to add info. that people would find fascinating. Don’t overdo Cute/Funny: An occasional cute or funny caption is great, depending on the photo of course. But if most of your captions are like this I’m not sure you’ll be taken seriously when the time comes to inform rather than amuse your viewers. Wittiness can, like everything else, be overdone. Welcome home: A typically understated entrance to an adobe house in Taos, New Mexico. Writing good captions takes some practice. But if you keep it simple, start with the basics – the What/Where/When – and if you add interesting tidbits only as you learn them, you really can’t go wrong. Have a great weekend and Happy Shooting! In this view of the Needles District of Canyonlands National Park, Utah, the early morning low sun highlights the spires, buttes and mesas of Indian Creek Canyon. The Abajo Mountains lie in the distance. The former mining town of Silverton in the San Juan Mountains of southwestern Colorado lies nestled in a high valley. Adobe rules in Santa Fe, New Mexico. I had never been to this part of the country and I wanted to see why it was so popular as a travel destination. Great Sand Dunes National Park was still closed because of the Govt. shutdown, and thinking it might open very soon (which happened) I made the detour down from south-central Colorado last week. I drove down to the little town of Questa in spitting snow. Camping above the Rio Grande River, I woke next morning to find about 4 inches of snow had fallen. The weather gradually cleared and warmed a bit over the next few days. I made my way first to Taos and then to New Mexico’s capital Santa Fe. Both are chock-full of adobe architecture, some of it very old and restored. This post will give tips for visiting the region and touch on its history. Images of the architecture will take center stage. The Rio Grande Gorge near Questa, New Mexico on a snowy morning. Both Santa Fe and Taos are great for strolling and exploring. Santa Fe is the more touristy of the two and is larger. But you’ll find no tall buildings in Santa Fe, and really not much traffic. Both are small enough to walk but Taos is very much a town compared to Santa Fe, which is a small city. Cathedral Basilica of St Francis of Assisi in Santa Fe, New Mexico. I started in Santa Fe, America’s oldest state capital (and highest at 7000 feet). It was founded by the Spanish in 1607 and played a big role in the early western expansion of the U.S. Many famous people have spent time here, both in historic and more recent times. The artist Georgia O’Keefe lived and painted here in the early 20th century. It also has a world-renowned opera. There is paid parking throughout the downtown area, in old-fashioned coin meters. If you’re willing to walk into the center, you can find free parking. I visited the friendly Capital Coffee, which is only 5 minutes walk from the edge of the historic center. After coffee, I used their parking lot to strike off into the streets and shoot. I was only a little over an hour doing this. I would not take advantage and spend half the day parked there. Adobe houses are, above all, simple. You can see the straw used in the adobe. I recommend simply wandering through the streets around the central plaza. The plaza (zocalo in Mexico) is a good landmark to keep circling back to. There are innumerable art galleries to visit of course. The town is a magnet for artists of all stripes. I focused on shooting exteriors here. I photographed mostly when the sun was low but not so low that shadows dominated. Built in 1607, this is America’s “oldest” house, though since it is adobe, it’s been continuously patched and rebuilt over the years. Rather than list places to visit, I urge you to check out Wiki’s travel guide (which includes a walking map) or do your own Googling. For the rich history of this 400+-year old city, you couldn’t do much better than start with the Palace of the Governors. This is the former center of Spain’s colonial government here and is now New Mexico’s state history museum. While you’re strolling, it’s very worthwhile trying to get access to the placitas (commonly called courtyards in most areas). Placitas characterize the architecture here. Found throughout Latin America as well, here these delightful open-air spaces are surrounded by low-slung adobe buildings. During my travels in Mexico, Central and South America, courtyards have been a favorite place to chill out and soak in the sun: reading, journaling and relaxing. Inside a traditional placita, this one at the Blumenshein Home in Taos. Traditionally several families would live in the homes bordering the placita, sharing it as an outdoor living and animal husbandry area. Some flowers and other plants were grown but placitas were not traditionally devoted to gardens as they mostly seem to be these days. Modern placitas (courtyards) also differ in being most often surrounded by one single-family dwelling. I found Taos to be much easier than Santa Fe in terms of wandering in and out of placitas, but you might have better luck than I did in Santa Fe. The Scottish Rite Cathedral is located a mile or so from the center of Santa Fe but is a magnificent building worth photographing. The moon rises over the Scottish Rite Cathedral in Santa Fe. I like Taos a little better than Santa Fe. Santa Fe seems a bit strange to me. Maybe it’s because of all the tourism clashing with history clashing with the modern influx of wealthy retirees clashing with the older residents of the area (many Native American) clashing with the new-age types. It seems to me to be a place lacking an identity. Also, real estate prices are way out of whack. So much of the adobe in Santa Fe looks like it was built yesterday, which I think takes away from the real history of the place. Taos suffers some of the same, but I’ve found this effect to run rampant throughout the world, anywhere history and authenticity gets in the way of modern life and “progress”. At least they keep to adobe construction and style here. Taos has some of the same vibe as Santa Fe but it’s much smaller and has a definite character. Besides being a gateway to mountain recreation (including great skiing), Taos is a fine place to wander around and photograph. Kit Carson, the famous scout and mountain man lived here. Or I should say his hispanic wife and their kids lived here while he passed through from time to time. One of the few windows in Kit Carson’s old home. The restored placita next to the Kit Carson Home in Taos, New Mexico. There is a main plaza in Taos as well. In Mexico and elsewhere in Latin America these zocalos or plazas seem to be much more “alive” with activity than in Taos and Santa Fe. I think it’s because of all the limitations in the U.S. for people to just set up carts with cheap eats. Here they serve as centers for shopping, much of it high end. In Mexico they’re places for street performers, strolling couples and great street food. The ones in New Mexico look just like zocalos but are not the same at all. You can park very near the plaza at one of the public parking lots (feed coins into the meters) or look for free spots 10 minutes walk to the plaza. You can just wander through the streets surrounding the plaza. The placita bordered by Kit Carson’s house is interesting, restored to near what it would have looked like. The placita at the Blumenshein Home is a great one too, and the narrow street it’s on, Ledoux, is lined with attractive adobe architecture. A great mural at the entrance to Ledoux Street in Taos, New Mexico. A couple places I neglected on this trip but which are certainly worth checking out are Taos Peublo just north of town and Ranchos de Taos a couple miles south of town. Taos Pueblo has some of the oldest buildings in the area. At Ranchos de Taos, the deservedly famous San Francisco de Assisi Mission Church is an amazing building. I suppose I need to skip some things to have an excuse to return! A bit of fall color in Taos, New Mexico. This high and beautiful area of New Mexico is certainly worth visiting. The climate is darn near perfect and the Sangre de Cristos Mountains are gorgeous. Also, the Rio Grande River flows through it. It’s a very beautiful stream that runs in and out of rugged canyons. One morning I took a frosty walk along the river and found some fall colors (image below). As usual, clicking on any of the images takes you to my gallery page, and all the pictures are copyrighted and not available for free download without my permission. Please contact me if you are interested in any of them; they’ll be uploaded to my site soon. Thanks for reading and have a superb week! The Rio Grande River and colorful cottonwoods between Santa Fe & Taos, New Mexico.